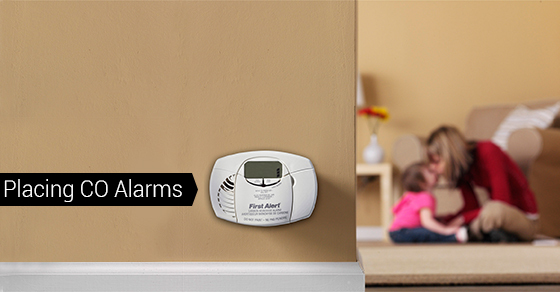 Finding The Right Placement For CO Alarms | Calgary Alarm Inc. Carbon monoxide is a toxic substance that prevents your body from properly transporting oxygen. It is commonly thought of as a “silent killer” because its presence is not detected by the body. Exposure to high concentrations of carbon monoxide can result in quick poisoning or, alternatively, if exposure builds up over time, it can happen slowly. Regardless, it can result in brain damage and death. Symptoms of carbon dioxide poisoning include headaches, dizziness, drowsiness, burning eyes and eventual loss of consciousness. Sources of carbon monoxide in your home include hot water heaters, furnaces, fireplaces and stoves, to name only a few. To reduce your risk of carbon monoxide poisoning, it is important to have these appliances installed professionally, as this will ensure proper ventilation. Maintenance of these appliances is also important. Carbon monoxide alarms, which function similarly to smoke alarms, also greatly reduce the risk of carbon monoxide poisoning. Where Is the Best Place for CO Detectors? One of the most important places you can put your carbon monoxide detectors is near your family’s bedrooms. This is because we are most vulnerable to carbon monoxide when sleeping. Ideally, you would place one near each bedroom, but if that is not possible, ensure that you place your CO detector in an area where it will be heard by all. This includes the kitchen, the living room and any other areas where you typically spend a lot of time. However, when it comes to your kitchen, carbon monoxide detectors should not be placed within 15 feet of cooking appliances. At least one carbon monoxide detector should also be placed on all floors of the home. For example, if you have a furnace in your house, ensure that you place a carbon monoxide detector nearby. The same holds true for any appliance that produces carbon monoxide. However, ensure that you do not install carbon dioxide detectors either directly above or next to appliances that are fuel-burning because they can emit a small amount of CO2 when turning them on. If you park your cars in the garage, it is also a good idea to place a carbon monoxide detector here.